Please keep in mind that the only magic trick Magic Mike can not perform is to be in two places at one time. Contact Magic With A Twist as soon as possible to get you desired date. Make a list of people who will be invited to the party/event. This will affect the space you will need as well as the amount of food, which will be ordered. What kind of party location are you considering? Or will the party be at your home or banquet hall. Magic With A Twist�s choices are almost unlimited. Please call Magic With A Twist to speak to a party planer expert. You may want to serve snacks or order pizza. Drinks for children to have at the party can be anything without red food coloring just in case of spills. The birthday cake and ice cream is a must, but to make things simpler make cupcakes for the children and keep the birthday cake for the family. 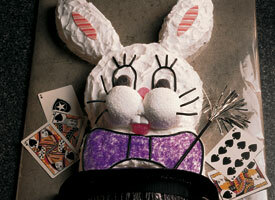 If you would like to make a magician�s bunny cake click on picture below. Organization is the key word to party planning. It is very important to be organized, make notes after phone calls and keep a small folder of phone numbers of your entire guest list so you can easily find them if needed. Contact Magic With A Twist to reserve your party date and time. Reserve location for party (if other than your home), make guest list, send invitations, plan menu. Send out invitations, shop for party favors, paper goods, and game prizes. Ask a friend or relative to help you on the party day. Order the birthday cake if you�re not baking it. Shop for menu items and prepare any food you can freeze. Call to verify a reservation if party is not in your home. Organize games or activities for party or you can rent games from Magic With A Twist. Pick up batteries and make sure your camera is working properly to catch those magical birthday memories. Prepare any food items you can store in refrigerator. Decorate the table, fill treat bags, set-up game area with supplies, pick-up birthday cake. Finish decorating place balloons on the mail box to help your guest find the party. 30 minutes before your event Magic With A Twist will arrive to set up. Set out food approximately 20 minutes before guests arrive. Relax and have a great party!